Thursday, January 10th will be an exciting day at the Brookings Arts Council as the winners of the print and online photography competition will be announced at the Reception from 4:30-6:30, awards presentation at 5pm. Awards will be given in color and black and white categories with 1st-3rd cash place distinctions for the print division in each category, with a new People’s Choice category for the online submissions. “We are also very pleased to have LaRae Gieske, a Sioux Falls professional photographer/artist and educator as our Judge. LaRae’s years of experience and photographic expertise makes her a wonderful artist to share her love and knowledge of photography as an art and a business” said Kuhlman. LaRae Gieske is a Photographer and co-owner of Greg and LaRae Photography and Owner/ Studio Manager of Contrast Studios in Sioux Falls. During her regular work week, she can be found teaching High School and Middle School Art at Axtell Park, an alternative school with the Sioux Falls School District. LaRae received her Bachelor of Art in Art Education from the University of Sioux Falls in 2002. She later returned to school to work on her Masters in Special Education and attended Armstrong Atlantic University in Savannah Georgia and later Western Governors University. LaRae’s professional interests are multifaceted; while she loves fine art and photography, she also has a heart for education and helping students who are struggling. Throughout her professional career she has made it her endeavor to balance business ownership, teaching and coaching. Her career launched in both arenas right after her under graduate studies and now LaRae has 16 years’ experience as a photography business owner and 10 years serving in the field of education. In addition to photography LaRae is also a painter, and much like in her own photographic style, she is interested in the aspects of light and color and how they interplay. Inspiration for her comes from raw emotion and special moments in people’s lives she documents through photography as well as capturing unique plays on color and light. Her and her husband, two young boys and two Boston Terriers, currently live in Sioux Falls. Their studio Contrast Studios and photography business Greg and LaRae Photography is located at 46598 268th Street, Sioux Falls, SD 57106. Their website is; https://www.gregandlarae.com/ or you can follow them on Facebook or Instagram at Greg and LaRae Photography. The Awards Reception will be held on January 10th, from 4:30-6:30, with awards being presented at 5pm. The exhibit will close on February 1st. 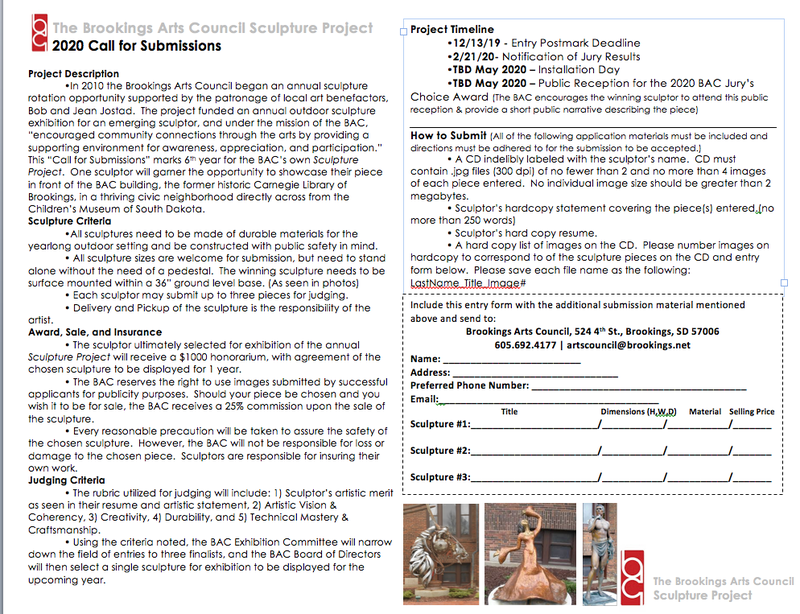 For more information regarding this exhibit or upcoming exhibits call the BAC at (605) 692-4177, email us at artscouncil@brookings.net, for most up to date, add us on Facebook.